Relationships are tricky (major understatement). 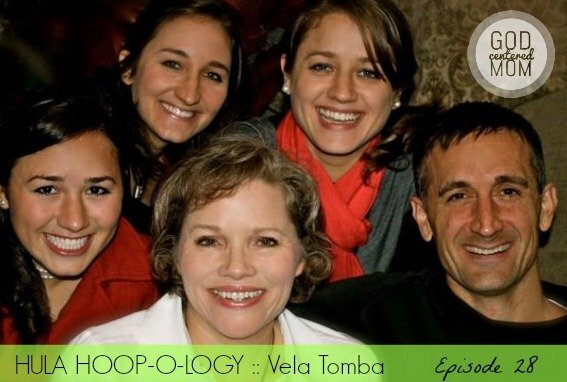 I think today’s podcast with my pastor’s wife, Vela Tomba, will give us words & imagery to help alleviate some of the trickiness. Vela has been married to Neil for 30 years, is the mom to three grown girls and grandmother to one adorable granddaughter. She served with Campus Crusade for Christ (Cru) before staying home full-time. Honestly? Her thoughts on this topic have helped all (absolutely all) my relationships. Do you struggle with staying out of others’ hoops? Which relationship challenges you the most? Hi, Vela! Thank you so much for sharing. I do have a question….how does this hula hoop perspective apply to church discipline? By that I mean Christian relationships where I have understood the Bible to direct us to lovingly and humbly approach a sister in Christ (or our husband or family member) about a persistent sin that she is abiding in. I know it isn’t my job to fix something, and approaching someone about the “speck in her eye” is not something I enjoy nor do often or without prayer, but is that a case where I don’t just mind my own hoop? I would appreciate your wisdom and insight here! Great question Kiki! I definitely think it is Biblical to approach another believer about his/her sin, in love. But I think what Vela is suggesting is not to take on responsibility to help them repent or change from the sin. I think sometimes we carry the emotional baggage of others or desire to control/change other’s behavior. I think in a discipleship/discipline situation, you are in a relationship of mutual care. Just like you would hope your friend would point out a sin they see in you. But you wouldn’t appreciate if they kept badgering you about it or took it upon themselves to make sure you stop sinning. Make sense? (of course, I’m TOTALLY speaking for Vela, which is me jumping out of my hoop. So just view this as my answer to the question…maybe I can ask Vela to answer for herself. ;)).